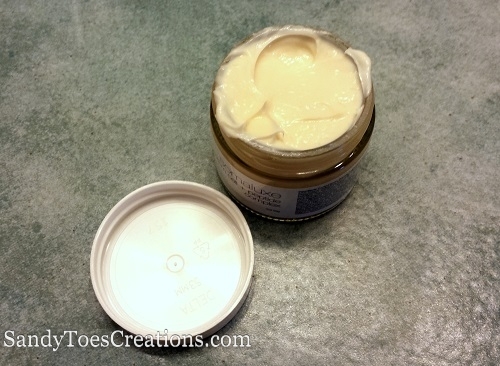 Are you looking for all natural skin and hair products that work beautifully? I have been searching for natural hair products to fall in love with for a long time. I’ve never liked using chemicals on my body and since I went green in my eating habits this year I have really wanted to expand that to all products I use, especially on my body. And I’ve been searching for a shampoo and conditioner that works on my hair. I’ve tried a few different store bought natural shampoos and the trouble is, many of them I love at first, but a month later I notice my scalp is more oily, or my hair is super dry. I tried using just some coconut oil and baking soda, i saw some gorgeous hair photo on Pinterest with a simple recipe for home made shampoo, so gave it a whirl. The first three days, my hair looked and felt fantastic, but then it turned into an oily mess that never looked clean. It’s been a disaster. Through all of this I have still had to go out in public to work and my poor husband has to look at me. Hey, at least I’ve had glowing skin! 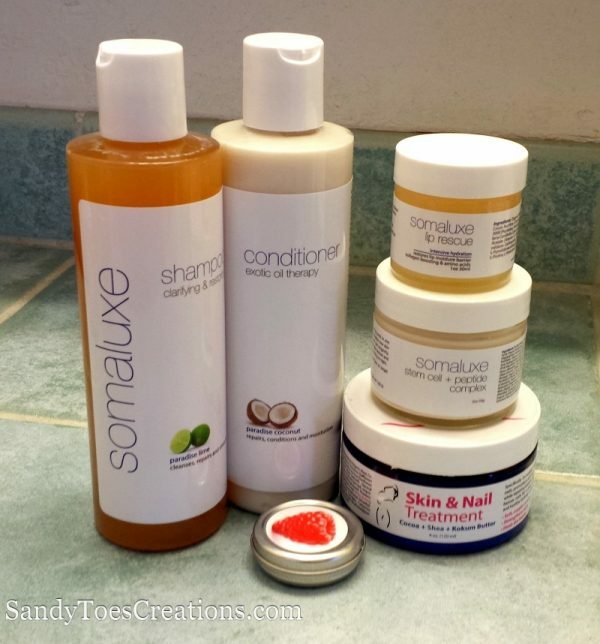 I have been using Citrus Clear Face wash and other Citrus Clear natural facial care products daily and love them so much, when I was offered to try some natural skin lotion by their sister company Somaluxe and get to try some natural hair care as well, of course I was in! This is a company of integrity. Any of the following products would make the best Christmas presents for women or holiday gifts for teen girls whether they are into natural products or not. Once they try these, they won’t want to return to using their toxin filled face creams and hair products. Look for the giveaway at the bottom of this post to win a holiday gift for your special ladies. Somaluxe states “We continuously look for the most advanced formulations in holistic, organic and natural skin care”. Sounds perfect! But I needed to try it for myself. I was encouraged when I soon got my package in the mail with beautiful little glass jars. They not only sent me the natural skin firming lotion, Somaluxe Stem cell + peptide complex, and full bottles of natural Somaluxe shampoo and conditioner, they also sent a large jar of Skin and Nail treatment, lip rescue cream, and an adorable tin of rasberry lip balm! To say I was excited is an understatement and I’m not one to fuss over beauty. My normal regime is to wash my face before bed. That’s it. In the morning I throw my hair in a ponytail and if I’m working, I’ll put on a little eye shaddow and mascara. That’s as glamorous as it gets. I don’t spend a lot of time in front of the mirror, there are too many more important things. But, I do want my skin, hair, and body to be healthy and not filled with harsh chemicals, so this was a real treat! I couldn’t wait to try it all! I have been using these green skin and green hair care products for over a month and I can’t rave about them enough! They each smell fantastic. 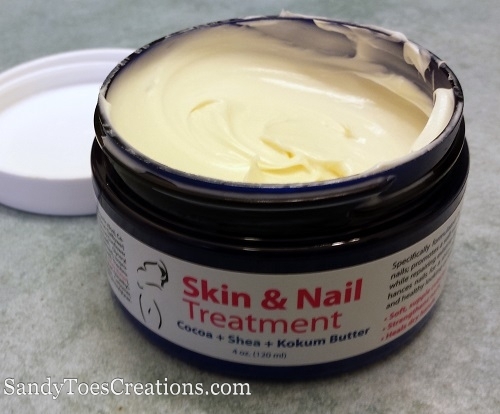 Have you ever wanted to eat your skin cream? Probably not, but these smell good enough to eat, and with all natural ingredients, they would probably be safe. Somaluxe Stem Cell Moisturizer, for anti-aging, wrinkles, and overall skin improvement. I don’t mind wrinkles, in fact I advocate them. Smile lines mean you’ve lived! But this cream is so buttery and feels great on my skin. And my skin looks more even toned and fresh. 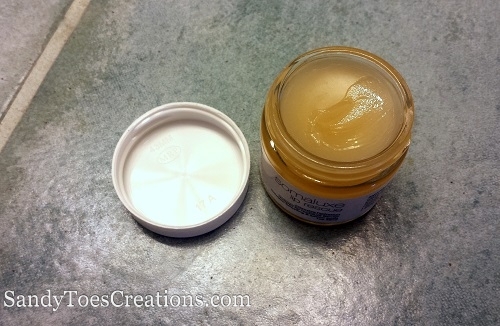 The Somaluxe Lip rescue feels like melted beeswax. It’s silky smooth, smells great, and makes my lips feel soft and smooth. It’s a beautiful thing. 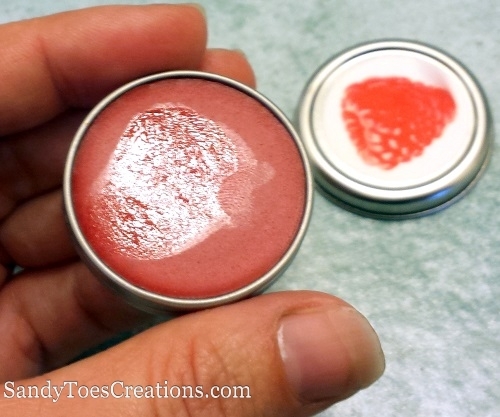 The Somaluxe Red Berry Lip Gloss smells delicious! It’s also smooth and wonderful feeling on my lips, with a hint of red. I just love it! But what about the shampoo? That was my main goal, to find an all natural shampoo that works wonders for my dry hair and now oily scalp. 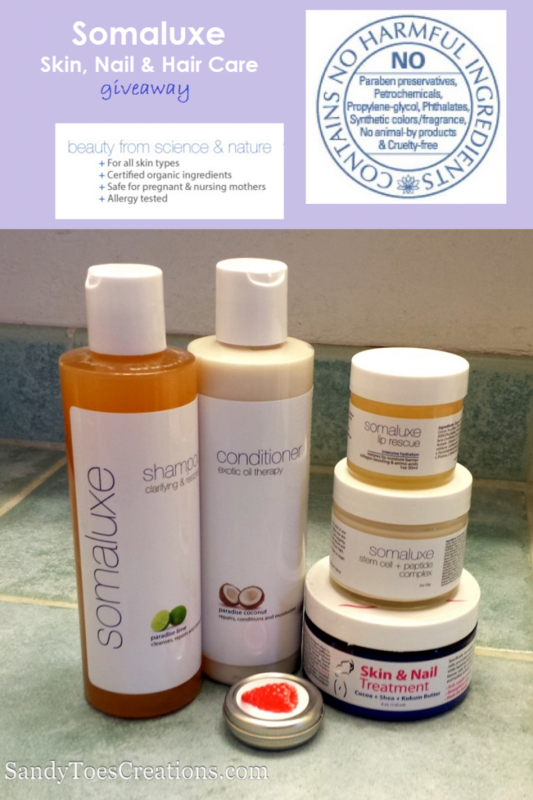 I have been using the Somaluxe clarifying and restoring shampoo and the Somaluxe exotic oil therapy conditioner. After just one use, I LOVED my hair! It was light, silky, shiny, and CLEAN looking! It felt so great to run my fingers through. 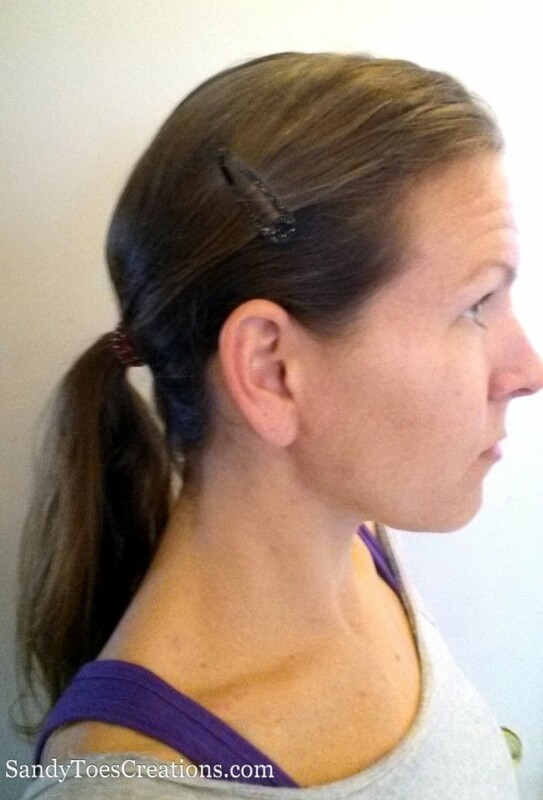 That very first day of use I put my hair in a pony tail and didn’t need any other styling products, I had naturally smooth silky hair without frizz! 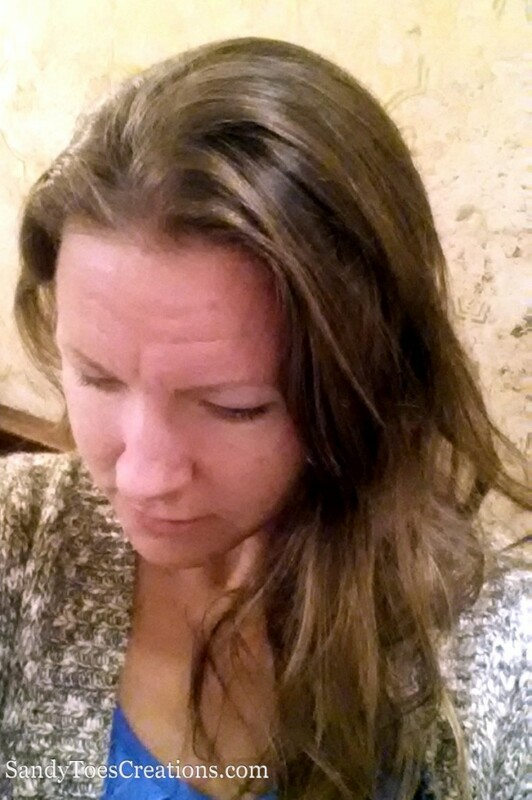 One month later, my hair is oh so soft, is fuller and healthier looking, shiny, and has more body. My hair feels smooth and also seems stronger. It was so dry it would break easily and now it doesn’t seem to break off as easily when I’m brushing. It doesn’t feel dry at all now. It easy to use and smells so good. I always sniff it when I put some in my hand before I rub it onto my scalp. Is that strange? Well, it makes me happy, so I don’t really care. If you’re looking for natural products for your skin and hair, or even if you’re not, you should switch to Somaluxe. Not only do they make great products, they care about your health and the environment. Also, they give a portion of proceeds to the Breast Cancer Research Foundation. I love to support companies that care and give back. 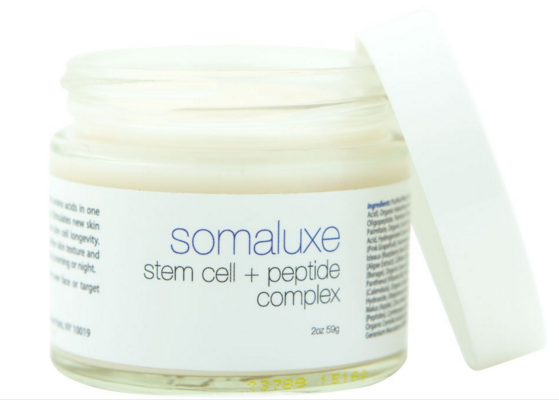 Somaluxe stem cell + peptide complex through this giveaway. Follow L. E. Mastilock’s board Natural home and health on Pinterest. The older I get, the more concerned I am with what I put on and in my body. Originally I wasn’t so concerned… but then I saw so many bloggers giving warning about toxins in skin care! I’m definitely more aware if anything! I’m very concerned about toxins and the mislabeling that occurs or blatant lies from the marketers! I am looking for hair products that give my hair volume and take out the oil but are natural! I’ll be honest, my biggest concern is simply with quality. I prefer natural type products, though. 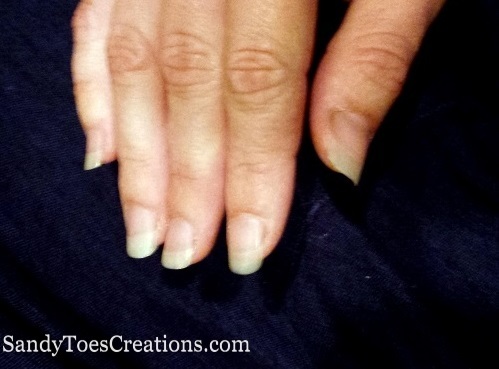 I am concerned about toxins and want to use more natural products. I am just looking for skin care with great ingredients. I do worry about toxins – you never know what they put in “skin care” products nowadays. Seems that many do more harm than good! The lip gloss looks so pretty! They don’t even have to approve ingredients with the FDA. Could be anything in there and much of it is toxic. I like to know it’s all natural. The shampoo would be great. Always looking for items that can keep my hair healthier and nice looking. Glad that you were happy with your results. I’d love to try the shampoo. My hair is a super oily mess. Menopause is doing such weird things to my hair and scalp. Just when we women get to know our bodies, they freak out and change everything up. God has a sick sense of humor. I agree with you Jill and L.E.! These past 2 years have not been fun. I am glad to hear it’s not just me and my imagination with these issues…off to see if these products are available in the UK. Absolutely. Just as you watch the things you eat you also need to watch what you use on your body.